North Carolina lawmakers still wringing their hands over reforming the state’s archaic and draconian liquor-control system should look to Kentucky as an example of what a legislature can do to boost tourism, nurture entrepreneurship, and promote innovation. Ten years ago, the Kentucky Distillers Association says, leaders of that state’s signature bourbon and distilled spirits industry poured whiskey on the Capitol steps to protest the latest tax hike on spirits. Today, a KDA news release says, they are pouring bourbon inside the Capitol to toast the industry’s epic turnaround. The number of distilleries in Kentucky has more than tripled to 68 in that time; the number of counties with a distillery has quadrupled to 32; and there are now nearly two barrels of spirits for every person in the commonwealth — valued at $3 billion, three times more than 2009. In 2005, North Carolina had one distillery. Now it has almost 60. Although the state has tweaked the laws enforced by the N.C. Alcoholic Beverage Control Commission — allowing distillers to sell five bottles per customer per year from their distilleries, for example — most of the restrictive Prohibition-era rules remain. 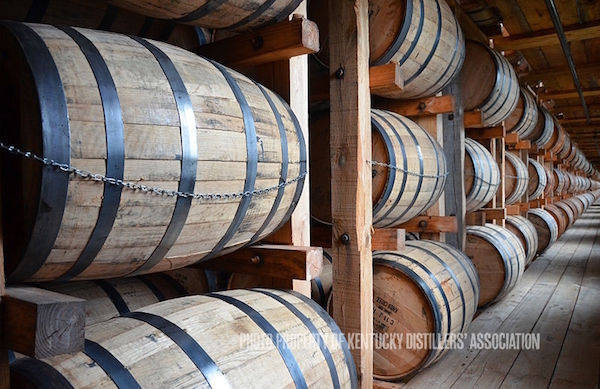 Eric Gregory, KDA president, applauded Kentucky legislative leaders for their work to modernize archaic alcohol laws, reform outdated tourism restrictions, and tackle the discriminatory tax that only Kentucky levies on aging whiskey barrels. “What a monumental success story,” Gregory said in the release. “By working together to remove unnecessary and artificial barriers to business, we have transformed Kentucky bourbon from an industry once viewed as ‘sin’ to one that truly defines signature impact, expansion, and global image. Kentucky Gov. Matt Bevin said distilleries — from craft startups to multi-national players — create jobs and investment throughout the state. The industry also draws related businesses, such as cooperages, marketing, retailers, and restaurants while spurring tourism and economic vibrancy statewide. Kentucky House Speaker David Osborne and Rep. Chad McCoy, both Republicans, were instrumental in the past two major pieces of legislation to benefit bourbon tourism — House Bill 100, which authorized vintage spirits sales in 2017, and H.B. 400 in 2018 that gives visitors the ability to ship bottles home. Rick Robinson, chairman of the KDA’s board and a vice president for Campari America, also highlighted Senate Bill 11 from 2016 and thanked its sponsor, Republican Sen. John Schickel. The biennial study was conducted by economists Paul Coomes and Barry Kornstein, formerly of the University of Louisville, in conjunction with the Kentucky Distillers’ Association. In the study, Coomes noted their analysis is based on data collected before retaliatory tariffs on whiskey exports were imposed by the European Union, China, Canada, Mexico and Turkey. Therefore, the impact on Kentucky distilling is not yet detectable in this report. Kentucky Republican Rep. Matt Koch this week filed House Bill 200 that would allow distilleries to sell exclusive bottles at their gift shops, a privilege that wine and beer already enjoy, as well as distillers in most other states and around the world, the release says. Koch said the measure would increase visitors to the famous Kentucky Bourbon Trail tour and the Kentucky Bourbon Trail Craft Tour. Gregory said Bourbon tourists made a record 1.4 million distillery stops in 2018 — a 370 percent increase over the past 10 years. The Kentucky Bourbon Trail logged 1 million visits for the first time since its creation in 1999. The KBT Craft Tour tallied 340,000 distillery stops, the most since its founding in 2012. Kentucky House Minority Leader Rocky Adkins, a Democrat, helped incentivize the growth in the Kentucky Bourbon Trail by sponsoring the Tourism Development Act in 1996, which provided tax incentives for new tourism investments. More than 20,120 people owe their paychecks to the spirits industry, a 104 percent increase in the past 10 years and 2,600 more since 2016. Distilleries are in the middle of a $2.3 billion building boom, nearly twice the projection from the previous study in 2017. Distilling has the second highest job multiplier in the state when it comes to total number of jobs and spin-off factor, behind only light truck and utility vehicle manufacturing. If the industry continues to grow at this rate, economic output will exceed $10 billion by 2020, with employment more than 24,000, with payroll over $1.2 billion. The number of distilleries has grown to 68, a 258 percent increase in the last 10 years. More than $235 million in tax revenue for local and state governments is generated by spirits production and consumption, an 88 percent increase since 2009. Kentucky exported more than $450 million in bourbon and other spirits in 2017; the export value has tripled in the past 20 years.